Many of you have asked why some of the stars of the Super Cats miniseries can be seen wearing radio collars, including the black-footed cat called Gyra featured in episode two. We asked Dr. Alexander Sliwa, leader of the Black-footed Cat Working Group and scientific consultant on the Super Cats series, why radio collars are a necessary tool for scientists to study wild cats. Picture Shows: Black-footed cat (Felis nigripes). They hunt amongst the short desert scrub in the Karoo of South Africa. 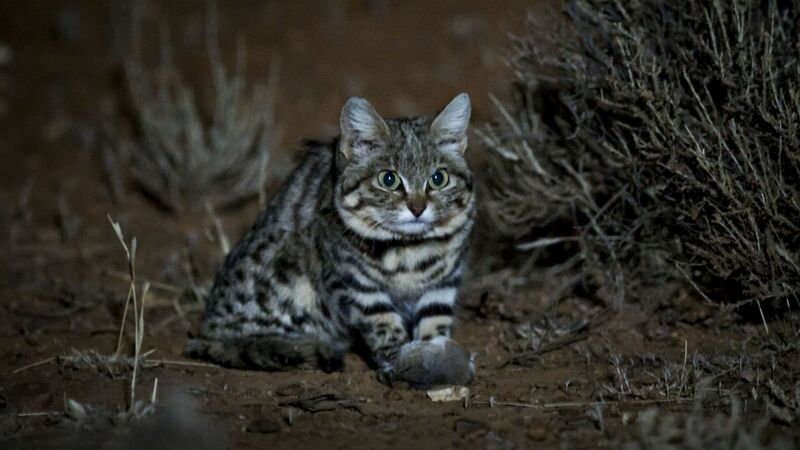 They are Africa’s smallest cat and the deadliest of the entire cat family – with a 60% hunting success rate. Anything that moves is a potential meal, from locusts to birds and gerbils. Radio collars are typically comprised of a small transmitter, battery and an antenna; they transmit a signal back to a receiver, so researchers can pick up the signal, and follow it to find the wearer. This is especially important when the animal you are studying is small and shy. Black-footed cats are Africa’s smallest feline, and they can quickly disappear amongst the short scrub plants of the Karoo desert, where they live. They are classified as Vulnerable by the IUCN (International Union for Conservation of Nature) Red List of Threatened Species, and so Dr. Sliwa says that “it’s crucial that as much is learned about them if we are to help protect the species. It was by studying them with radio collars that allowed Dr. Sliwa to discover that black-footed cats have a 60% success rate when hunting – the highest of any cat, which gives them a claim to being the deadliest in the entire cat family. Over the past 26 years, Dr. Sliwa has fitted 65 black-footed cats with radio collars and this has given him an insight into their secret lives, that would otherwise be impossible to see. He says that it’s “an enormous opportunity to learn about their hunting strategies and success, and the type of prey that they depend on”. Editors Note: This article was originally published by the BBC.